Zoom is becoming the go-to online platform for web conferencing and webinars, and a highly recommended tool amongst AIIP members. 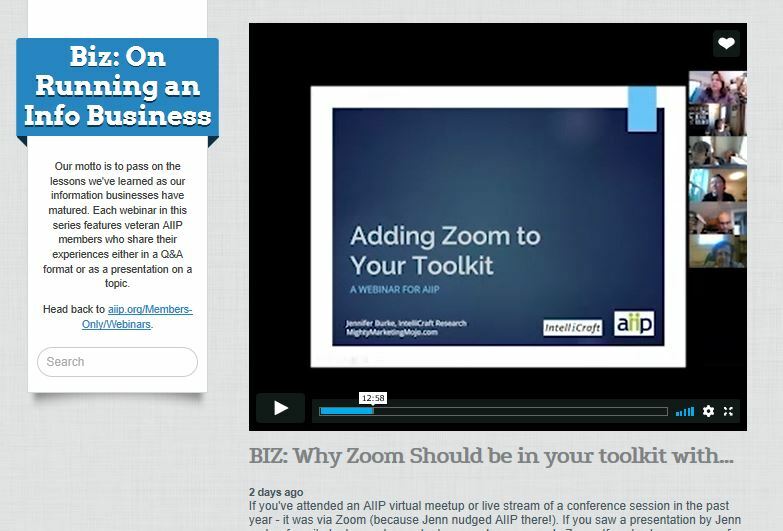 AIIP’s final webinar for 2018, Adding Zoom to Your Toolkit, was delivered by our AIIP Zoom expert, Jennifer Burke from IntelliCraft Research LLC and MightyMarketingMojo.com. As with all things AIIP, the focus was on how to best use Zoom in your information professional business and covered, what time of day is the best time for a training session, the most effective way of monetizing your webinar and the pros & cons of BLAB. Webinars are a great way to interact with current or prospective clients and your own staff. Its video format adds clarity and is time-efficient. Webinars can offer a good ROI. Monthly plans can vary widely in functions and price, just as audio/video conferencing platforms can vary widely in ease-of-use, and quality of audio/video. Some benefits are passed along to your clients. Saving yourself time and money, is saving your client time and money; the convenience of increased mobility is an increased convenience for your client. Clients will appreciate that. And that translates into an exceptionally fine marketing tool whether you are using Zoom within the US or globally. Zoom can grow with you while providing a decent ROI. And it allows you to promote upcoming events by using banners on your registration page: another great marketing tool. The free version of Zoom would allow for meetings of up to 100 people for 40 minutes. So, you don’t have 100 people – yet. Not to worry; you can have a meeting of 2, or 10 or 100. Other free options include screen-sharing, document-sharing, whiteboards, and break-out rooms. Break-out rooms allow you to set up independent groups within the main meeting. The moderator can enter each room, but the meetings are run independently. Each group can save their chats which will be placed in Documents, in a folder named – Zoom. Nothing easier. If … when… you need fewer participant or time constraints or require more functionality, Zoom has several paid versions. Paid versions currently start at about US$15.00/month, with more advanced options available. If you need to switch between different plans, you can do so as needed. Monetizing your webinar is easy. Zoom allows use of Paypal with attendees having the option to pay by credit card or Paypal — as they register. This is just a small sample of the power of Zoom. BLAB (booklikeaboss.com) is just one example of the type of ancillary information you get in an AIIP webinar. BLAB also works with services such asPayPal to accept client payments when they register for a meeting or purchasing items. There are free and paid plans available. This type of additional information is a routine part of AIIP webinars – you learn the answers to questions you didn’t even know you should be asking! Many thanks to Jennifer Burke for introducing AIIP to this application and the work put into crafting a very informative webinar about Zoom.